We find a common language. Professional networking site LinkedIn has continued to grow since it was acquired by Microsoft for a whopping USD 26.2bn in late 2016. The site now has more than 500 million users and reportedly generated USD 1.3bn in revenues in the first quarter of 2018. While many people continue to see LinkedIn as an online version of their resume, an increasing number of professionals find the site useful for personal branding, sales, business development, and research. Different from other social media sites like Facebook and Twitter, LinkedIn generates much of its revenue not from ad sales but from subscription services for recruiters and business development professionals. Paid subscribers are able to search LinkedIn’s extensive database in much more granular detail, which is useful for targeting potential recruits or prospective clients. Some premium subscriptions such as Sales Navigator enable searches based on industry categories. One of the 147 such industry categories featured on LinkedIn is Translation and Localization. While not among the top categories – that honor goes to IT and Services(15m profiles), Financial Services (8.5m) and Computer Software (7.6m), the Translation and Localization category still lists an impressive 603,700 professional profiles and 21,400 so called “accounts”, i.e. LinkedIn company pages. For what it’s worth, we sliced and diced that data and compiled a list of the top 50 countries by professional profiles and top 50 countries by company pages. Unsurprisingly, the United States leads the table with over 90,000 professional profiles in Translation and Localization. More interestingly, China, which has shut out most other Western social networks, comes in second with 36,700 professional profiles (overall, there are 37 million LinkedIn profiles from China). 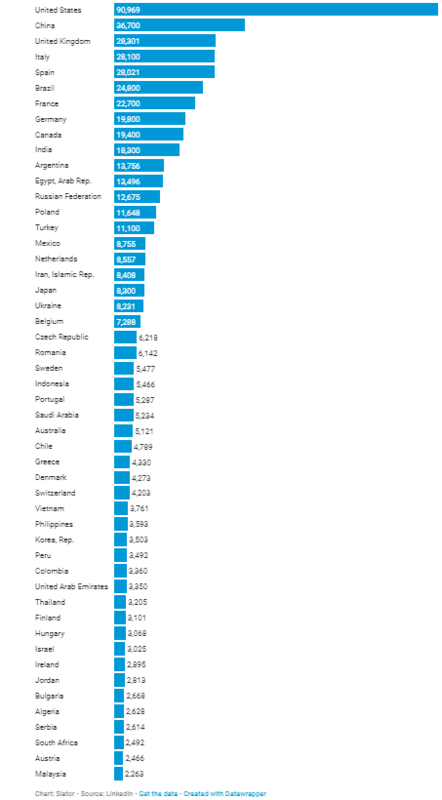 Rounding out the top 5 are the UK with 28,300, closely followed by Italy (28,100) and Spain (28,000). 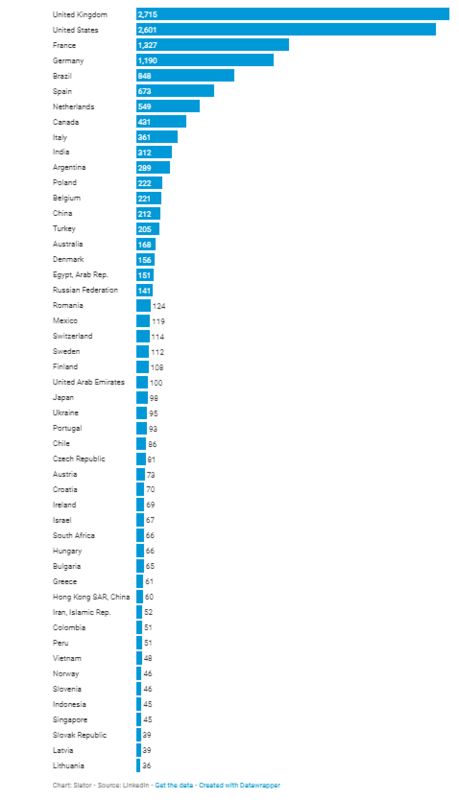 Looking at company pages, a different picture emerges: the US (2,601) loses its top spot to the UK (2,715) followed by France (1,327), Germany (1,190), and Brazil (848). On a continental scale, Europe takes a clear lead over both North America and Asia. To the 11 translators apparently typing away in Antarctica, we salute you. Finally, let’s look at a selection of leading language industry providers and their following on the social network. Just as in real life (i.e. in terms of revenue), Lionbridge and TransPerfect battle it out for number of profiles and followers. Employees at SDL, meanwhile, seem to be more present on LinkedIn in general since, despite the relatively lower number of staff in the real world, SDL beats both TransPerfect and Lionbridge when it comes to LinkedIn profiles. 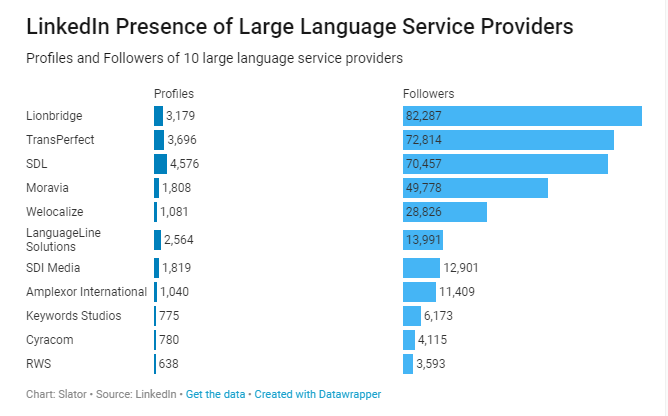 Of course, data from LinkedIn does not present a fully accurate picture of the size and distribution of the language industry in the real world. In Germany, to name just one example, LinkedIn struggles to gain a dominant position, competing with local alternatives such as Xing. Furthermore, translation and localization professionals working internally at large corporations may not choose Translation and Localization as their category but rather their employer’s industry. 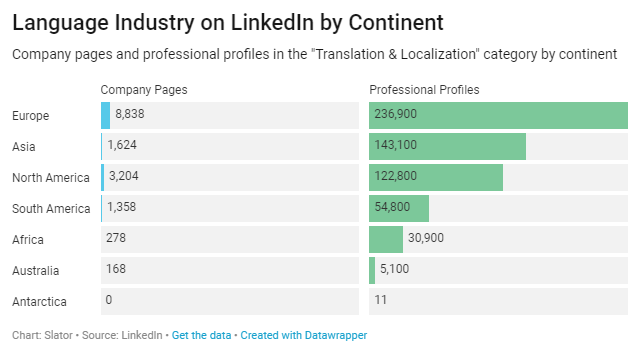 That said, crunching LinkedIn’s Translation and Localization numbers is still interesting since it enables you to get a feel for just how big and widely-distributed this industry is.